GERALD R. FORD and JOHN R. STILES. Signed Book. Portrait of the Assassin. New York: Simon & Schuster, 1965. First edition, first printing. 508 pp., 6½ x 8½ in. Lyndon B. Johnson appointed House Minority Leader Gerald R. Ford to a seven-member “President’s Commission on the Assassination of President Kennedy.” The commission was chaired by Chief Justice Earl Warren and included two Senators, two Congressmen, the former director of the Central Intelligence Agency, and the former director of the World Bank. Ford was assigned responsibility for preparing a biography of Lee Harvey Oswald (1939-1963), whose murder two days after he killed Kennedy left many unanswered questions. The Warren Commission interviewed more than five hundred witnesses and submitted its report to President Johnson on September 24, 1964. It concluded that Lee Harvey Oswald, acting alone, assassinated President Kennedy. The Commission published its 889-page report in November 1964, along with twenty-six volumes of supporting documents. The evidence and conclusions of the Warren Commission have been the subject of intensive review and examination, both fact-based and otherwise. Conspiracy theories abound, including accusations that Ford intentionally altered a part of the final report to support the “Single Bullet Theory,” the Commission’s conclusion that a single bullet fired by Oswald penetrated both President John F. Kennedy’s neck and Texas Governor John Connally’s torso and wrist before lodging in Connally’s thigh. 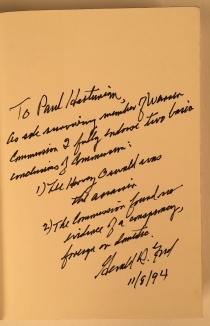 The commission staff originally wrote: “A bullet had entered his back at a point slightly above the shoulder and to the right of the spine.” Ford suggested changing that statement to read: “A bullet had entered the back of his neck at a point slightly to the right of the spine.” The conspiracy community seized upon this change as evidence that the Commission covered up the evidence of two bullets and two assassins. 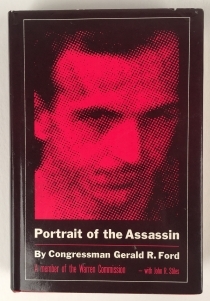 Ford’s biography of Oswald, written with Michigan businessman and Republican campaigner John R. Stiles (1916-1976), was published in 1965. 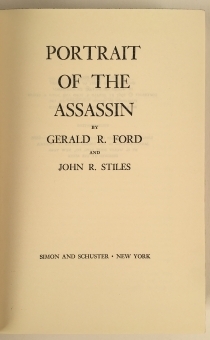 Much of Portrait of an Assassin is a distillation of the twenty-six volumes of evidence and direct testimony collected by the Commission. 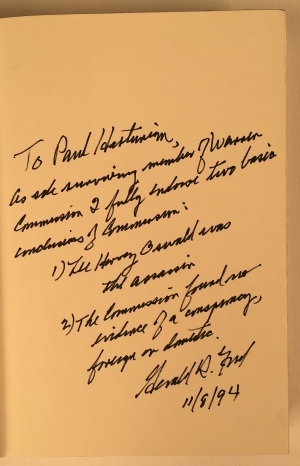 Nearly thirty years later, as the sole surviving member of the commission, Ford inscribed this copy and reaffirmed the general accuracy of the Warren Commission’s findings. Three subsequent U.S. government investigations in the 1960s and 1970s agreed with the Warren Commission’s conclusion that two shots fired by Oswald struck President Kennedy from the rear, and one of those shots also struck Connally. A subsequent investigation suggested that another unknown assassin fired at the President but missed; this conclusion is disputed. Gerald R. Ford Jr. (1913-2006) was born Leslie Lynch King Jr. in Omaha, Nebraska, but his parents divorced months after his birth, and he grew up in Michigan. His mother married Gerald Rudolff Ford in 1916, and she renamed her son after her new husband. Ford did not legally change his name until 1935. He became an Eagle Scout and graduated from the University of Michigan in 1935 and from Yale Law School in 1941. Ford served in the U.S. Naval Reserve and the Navy during World War II. Returning to Michigan, he became active in Republican politics. He won election to the U.S. House of Representatives in 1948, serving to 1973, the last nine years as House Minority Leader. When Vice President Spiro T. Agnew resigned in October 1973, Ford became Vice President. Ten months later, Richard Nixon resigned, and Ford became President. He narrowly lost reelection to Jimmy Carter in 1976. Near fine, interior clean and bright, in original dust jacket with a few nicks to top edge. Red cloth boards with unfaded titles to the spine. Black top stain applied by publisher.